In 2015, Railly travels to Chechnya to see if Cole is still there, alive or dead. In 2043, Ramse travels to the Project Spearhead headquarters, where they're trying to develop a cure for the plague, to acquire a needed part. So if the army/science base has the cure for the 2033 version, and Cole's in 2017, if they can do one more round trip then there can be at least a partial timely solution to the plague, right? I would hope they'd at least try it, and then we can have more weird alt-future shenanigans. I think Secret Kid has to be one of my most loathed tropes. Sigh. I admit to a general feeling of disappointment in this episode. I thought last week's episode would have made a good end to the series (I'd been under the impression it was going to be a miniseries, though I think that must be wrong now). Though I quite like Cole, I was sort of hoping he was actually dead, and hadn't been rescued by last-minute splintering, because that feels like kind of a cop-out. And the stuff with Spearhead just seems like unnecessary conflict at this point. 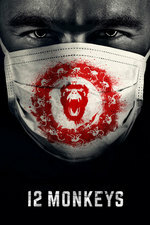 We've got bad guys: the Army of the 12 Monkeys, the plague, and the unstoppable march of Cosmic Fate (or whatever). We don't need more antagonists.